Staying at the Old Bakehouse in Robin Hood’s Bay, you are just a few minutes’ walk from the beach and the Bay’s many cafes and shops. Robin Hood’s Bay is one of the most popular coastal locations in Yorkshire, or the UK for that matter. Once home to the busiest smuggling trade on the Yorkshire coast, said to involve fisherman, clergy and gentry alike, today the village has adopted a much more sedate pace of life. The village is a maze of cobbled streets and higgledy piggledy houses which seem to tumble down towards the sea. Walkers can delight in the fact that Wainwright’s famous Coast to Coast walk starts (or finishes depending which way you look at it) just a few yards from the door. And the Bay itself is just one of the charming locations on the coast. For dinner head down to the very romantic Bramblewick Bistro, or the nautically themed Smugglers Inn opposite. Both have a lovely atmosphere particularly at night when you can bunker down for a candlelit dinner over a bottle of wine or two. There are also several good pubs in the village with pub grub. If you want to dine in take advantage of the well-stocked local stores there, including an excellent fish mongers selling the freshest locally caught crab. The kids will love the traditional sweet shops and there are several really lovely little boutiques selling all manner of delightful things. As hard as it will be to drag yourself away from Robin Hoods Bay, you really ought to explore the rest of the coast. Much like its Cornish counterpart, the Yorkshire coastline is a heady mix of rugged cliff tops, peaceful bays and pretty fishing villages. With long sandy beaches and all the traditional seaside trimmings of yesteryear, this is proper bucket ‘n spade territory. That’s not to say it’s stuck in the past, in fact the coast’s villages and towns combine the traditional with the contemporary effortlessly, with trinket shops and tea rooms sitting alongside upmarket champagne and oyster bars. This region is best known for the gorgeously gothic town of Whitby. Playing host at one time to Romans, Saxons, Celts and Danes amongst others, the town’s rich heritage is immediately obvious. Straddling the river Esk and dominated by the 13th Century ruins of St Hilda’s Abbey on the East Cliff, Whitby’s crooked cobbled streets and picturesque harbour have been a magnet for artists and tourists alike for centuries. Providing the backdrop for some of Lewis Carroll’s work, it was also famously the inspiration for Bram Stoker’s Dracula. For a real sense of the town’s atmospheric ambience, climb the 199 Abbey steps at dusk and wander around St. Mary’s churchyard on the headland… You can further indulge a desire for the macabre on one of the regular ghost walks from Whale Bone Arch on West Cliff. 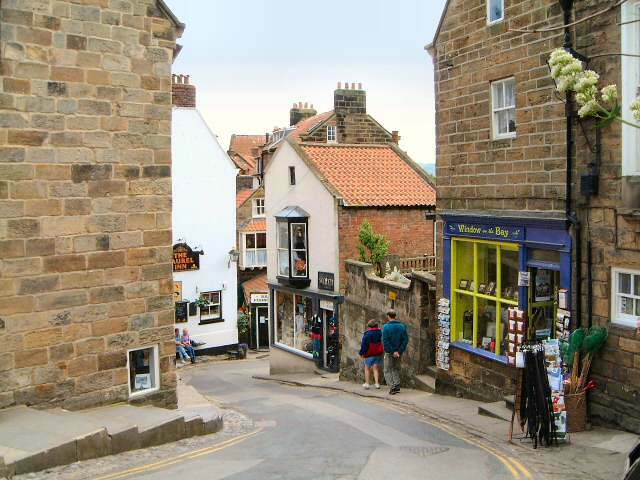 Although you could happily spend the weekend mooching about the independent shops, bars and cafes along Whitby’s bustling medieval streets, it’s well worth striking out to sample some of the other less known coastal villages nearby. Sandsend, Staithes and Runswick Bay are all within easy driving distance, and each have their own unique charm.